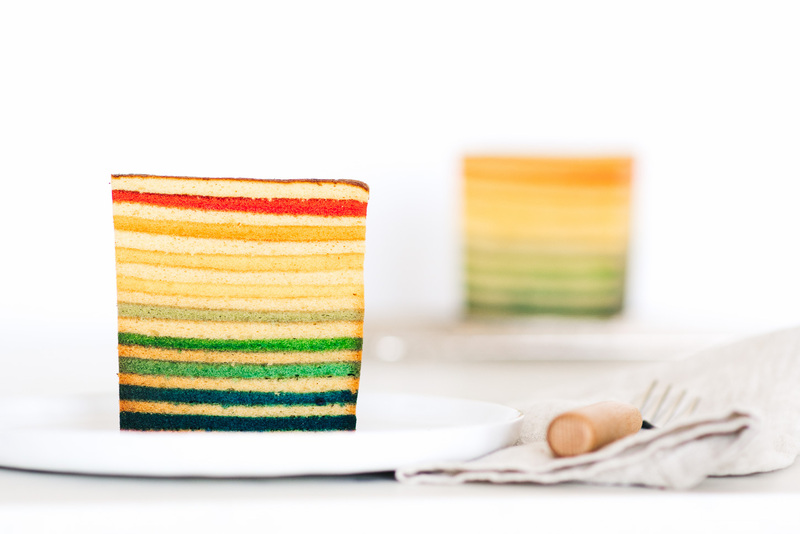 The ultimate rainbow layer cake. Got a lot of time on your hands? Then this cake is for you! When I was young, my mom used to bake. A lot. She made multitudes of muffins, loads of loaves, countless cakes. There was this one cake in particular that our whole family was in love with. She called it butter cake and I think it was a simple pound cake, but I’m not sure; I just texted her to find out. She always made it in an angel food tin, even though it was nothing like angel food cake. It was dense, buttery, sweet, and the smell while it was baking was out of this world. We used to eat it fresh out of the oven, barely cooled. It was pure love, baked into a cake. She just texted me back: “Yes butter cake. Eggs, butter, flour and sugar. 1 lb of butter!” Now, unlike me, my mom rarely uses exclamations marks, so for her this gives me a clear idea of why she never makes the cake anymore: butter. I’m hoping that butter is still okay and she just doesn’t bake cause she has other things to do because I made this rainbow cake for her birthday and, um, there are 12 egg yolks and a heck of a lot of butter in it. It also has 18 layers, 9 colors and a lot of love! 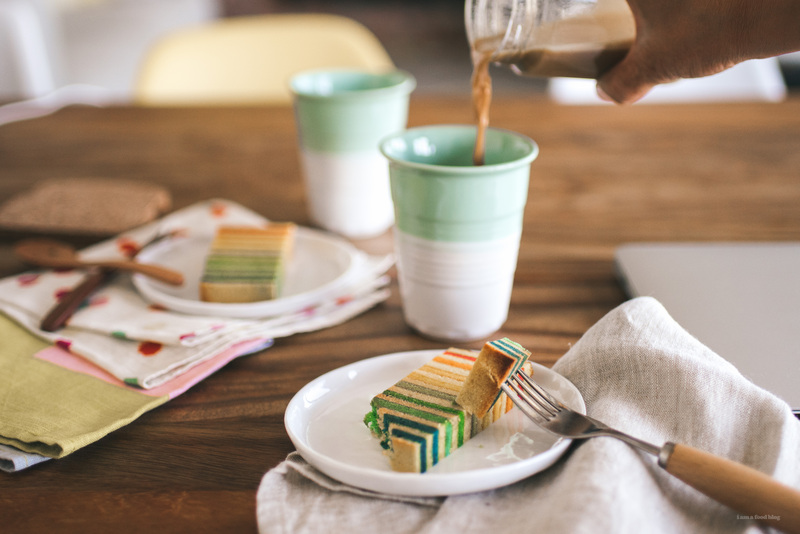 This particular rainbow cake is, at its heart, a butter cake. It’s a riff off of a Malaysian cake, kek lapis. It’s a dense, multilayered cake that’s usually spiced with cinnamon, ginger, nutmeg, and cardamom. It’s buttery, rich, and really really good, especially with tea or coffee. It’s the kind of cake that most people buy because it takes so long to make – you have to bake each layer individually. I’m not going to lie, this cake took a LONG time to make. Originally it started out with 11 colors, which made it come out to a 23 layer cake, but the bottom layers got a little too well done, so I cut them off. I also just made this version vanilla only because my mom has a huge aversion to cinnamon. It was well after 11pm when I finally finished baking it, but it was worth it to see my mom’s face light up when she realized what kind of cake I made her. This post is a little after the fact, but happy birthday Mom! Cheers to many more years of us eating cake together. PS – This is what my mom texted me when I asked her if she ate her cake leftovers yet: I have one small slice left, gonna eat it later. Yes, it’s very yummy and I like it. Did you find any more pikachu? Heehee. Oh, mom! Isn’t she the best? This cake is an undertaking, both in ingredients and in time investment. But it’s worth it! 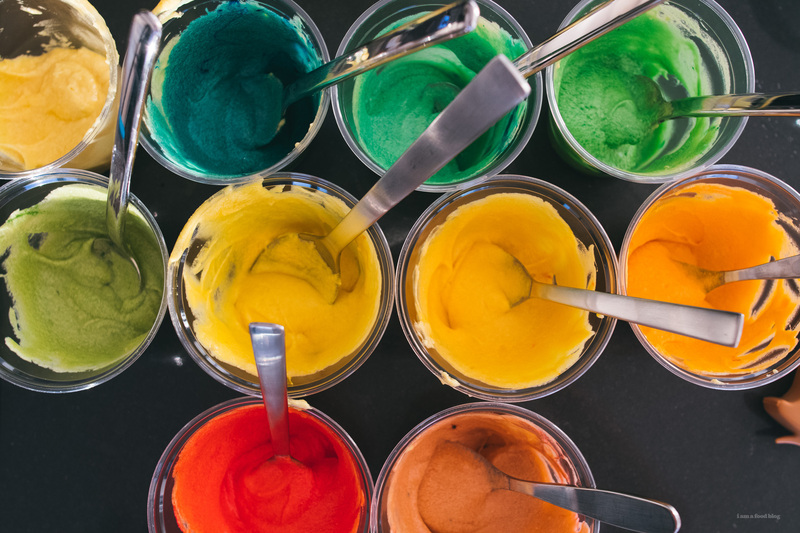 You definitely don’t need to go the rainbow route, but if you do, I recommend gel or powdered colors, the regular food coloring that you get at the grocery store will dilute the batter too much. Don’t start this cake unless you have the time to devote to baking, you’re going to need at least 2 hours of active baking time, staying by the oven to take the cake out and pour on new layers. 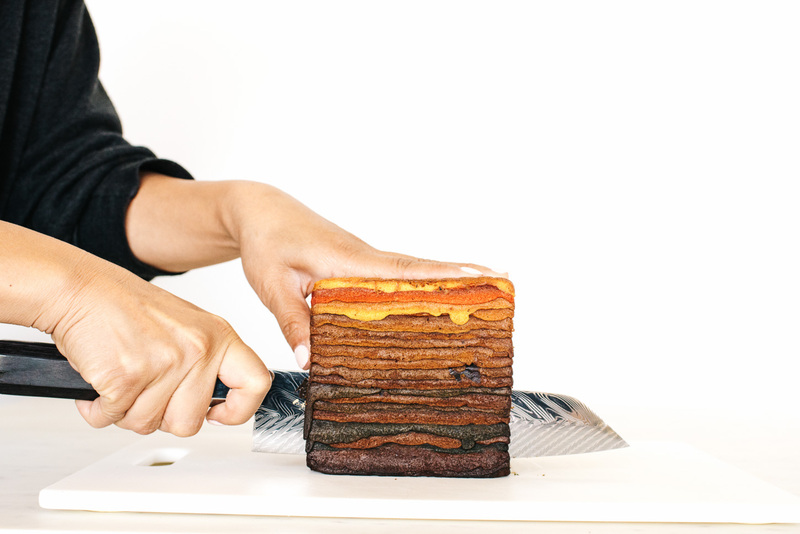 If you don’t color your layers, you’ll still end up with a gorgeously layered cake due to the light browning that will occur on the top of each layer. Arrange your racks so that one of them is in the top third of the oven – it should be one spot away from the top rack. Preheat the oven to 350°F. Line the bottom of a 6 inch square pan, preferably without non-stick coating (see notes) and butter the sides. In a stand mixer, with the paddle, beat the butter until light and fluffy. Cream in the sugar. On medium-low, add the yolks in, one at a time, beating well after each addition. Beat in the condensed milk and vanilla extract. 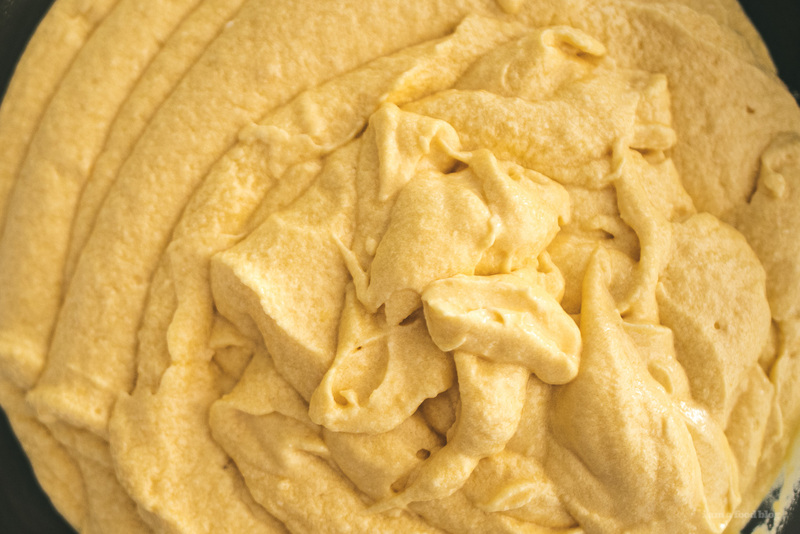 Sift the flour into the butter mix and fold in gently until just combined. Scoop the butter mixture out into a separate large bowl and set aside. 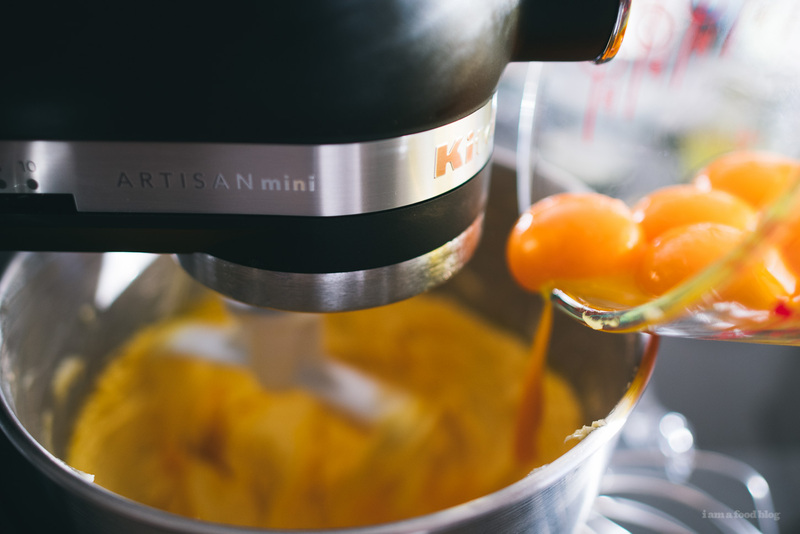 Clean the bowl of your stand mixer throughly – you want it to be completely grease free. With the whip attachment, beat the whites on medium until foamy. Gradually turn up the speed and pour in the sugar in a slow, steady stream. Beat until stiff peaks form. Fold in the whipped egg whites into the butter batter, in thirds, being careful not to deflate the whites. Place your prepared pan into the oven, to preheat. At this point, if you’re going to go the rainbow route, you need to weigh the total amount of batter you have. You’ll need to divide the batter into the number of colors you have, plus 1 extra layer. So if you have 9 colors, like I did, I needed 9 colored layers + 9 white layers + 1 extra layer on top. So I divided my total batter weight by 19. Once you figure out how much each layer is going to weigh, weigh out all of the layers and color them. Carefully take the pan out of the oven and pour in an un-colored layer, using a spoon to push the batter (which will be much more liquid-y when it hits the hot pan) to the edges. Switch the oven to the low broil function and place the pan in the oven for 3-5 minutes, or until it is lightly browned. Check often because the thinness of the layer will make it very easy to overcook/burn. When it’s lightly browned, remove from the oven. It should be slightly firm. Spoon on the next layer, your darkest color. Bake for 3-5 minutes. Remove and then spoon on an un-colored layer. Repeat until all the layers are cooked. At the end, the cake should feel quite firm and should be cooked through. Let cool in the pan for 10-15 minutes before turning out onto a rack. Let cool completely before trimming off the sides. This cake is best eaten the next day so wrap tightly in plastic wrap until you’re ready to eat. Slice, and enjoy! Notes: If you use a non-stick pan your cake will release easily, but you’ll probably end up with sides and a bottom that are more well done. I had to trim off quite a bit of my cake due to this, so I recommend using a “stick” pan. There’s something about non-stick coating that causes higher heat, so I’d just stay away, if possible. If you want to bake a cake without any color, just skip out on the coloring portion of the recipe. You probably don’t need to weigh out each layer, either, if you’re not to particular. Just use a 1/4 measuring cup to measure out each layer, which will ensure that the layers are equal. Wow. This is a gorgeous cake. I’m tucking this one away for my next special occasion. First of all, a happy belated birthday to your mother. What a beautiful gift with which you have honored her. Second, this very cake has been brought up numerous times among some of our close international friends. Admittedly, I was unfamiliar with it but only recently have been able to wrap my head around it through those multiple conversations. Now, thanks to your post here, I have a better understanding about what all the fuss is about! You have blown me away by your styling and presentation here. I must say that I feel a bit daunted at the prospect of me being able to put something like this together. I am though, always up for a challenge. Especially when it comes to baking. Thanks you for the inspiration, it give me just one more goal to work toward. DUDE THIS IS INSANNNNE!! happy birthday to your mama! This cake is absolutely inspiring!!! I was surprised that it’s all baked together, I’m so used to traditional layering. wow! Also your mom sounds like she is just too cute. Holy moley! This cake would make any mama proud! Cake looks great. Must ask where the coffee cups in the picture are from? Oh my!! A true labour of love. Those perfectly even layers are so impressive. Your mom is a lucky woman. Butter rules!!! Hooooooolllllyyyyy moly! 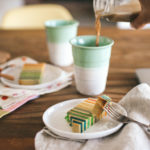 I’ve seen a couple of people do a rainbow Malaysian layer cake (kek lapis) before but jeeeeezzzz you have so many layers omg it must have taken forever!!! The spiced layers are the best though; I used to carefully nibble/peel them off layer by delicate layer as a kid. OMG AWESOMENESS. So detail in every layer. I love it. holy shitoli STEPH!!! This cake is crazy crazy cute and I am FEELING that picture of all the little batters getting coloured up. So much work but SO worth it to surprise your mama with this beauty!! The happy face spoon and fork are making me smile, too. EPIC CAKE! WELL DONE, LADY!! AHH! it came out so cute!!! Beautiful cake! Any chance you can also share your moms recipe for butter cake in an angel food cake pan? Thanks! Hi Stehanie – this recipe is exactly what I’ve been looking for but I’ve been desperately searching for the pan to cook this cake: 6×6 doesn’t come easy in France. Can you give me any pointers please (Amazon or other that can deliver to Europe). Thanks and keep up the great work! you can make it in a loaf pan – it won’t come out as high and you may need to adjust the baking time of each layer. or you can double the recipe and do it in an 8×8. hope that helps! As a Malaysian American, I’m impressed with your kek lapis! 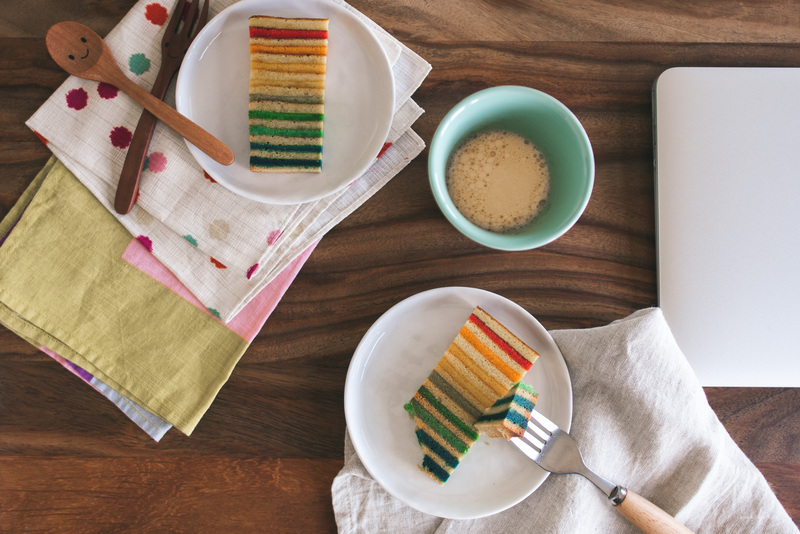 Rainbow cake is just an awesome recipe! It sure looks delicious and easy to make. Thanks for sharing!